On behalf of the Sunshine Coast Council welcome to the Maroochy Bushland Botanic Garden. The Garden provides an opportunity for both residents and visitors to the region to relax and enjoy both the formal display gardens and bushland environment. The Botanic Garden site covers just over 80 hectares with approximately 12 hectares being developed as display gardens and over 4km of walking trails accessing the surrounding bushland. This tour has been developed as a partnership between Council and The Friends of the Garden. Your tour is guided by Margaret, one of the volunteer guides and provides an informative overview of the Bushland Sculpture Garden from its inception from the 2005 Sculpture Symposium through to the development and the display of the individual pieces. 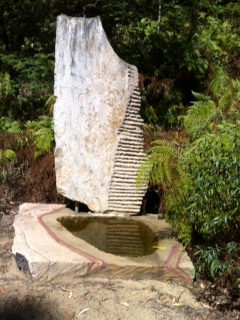 The garden showcases both international and Australian based sculptors. Enjoy your walk. In 2005, the Friends of the Maroochy Regional Bushland Botanic Gardens hosted the Stone International Symposium. The inspiration and theme of the symposium was to 'provide an experience of harmony between man and the living earth'. Please stroll through the garden at your own pace and view all or a few of the 25 works that catch your interest. The works include three artisan-crafted bench seats where you can sit and take a moment to enjoy the special calm and peace of the garden. For those who wish to view all pieces in sequence from the entrance, please take the first left hand fork in the trail and proceed in a clockwise circuit, which will eventually lead you back to the entrance point where you now stand. Council encourages you to respectfully interact with the sculptures - to feel the contours, different textures and lines of the works with your hands. I now invite you to enter this beautiful garden, where I wish you the experience of feeling 'the harmony between man and the living earth'. Please select any item from the Sculpture Catalogue to access text or audio commentary, or both. 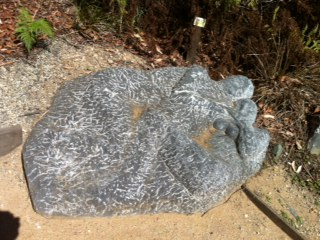 In 2005, the Friends of the Maroochy Regional Bushland Botanic Gardens hosted the Stone International Symposium. Over a period of some two-and-a-half weeks, eight sculptors created 13 works of art, which are now displayed within the inspiring Bushland Sculpture Garden along with 12 other works that were created, acquired and added to this wonderful collection soon after the symposium. All 13 works were produced at the symposium by two Australian and six international sculptors from Japan, South Korea, Slovakia, USA, France and Spain. The symposium was organised and paid for by the Friends of the Botanic Gardens using money generously donated by members of the group, the local community, and by funding provided by the former Maroochy Shire Council. During the two-and-a-half weeks in which the works were completed, members of the public were free to watch the sculptors at work - to appreciate and understand the process of creating sculptured works of art from blank blocks of stone. Generators were required to provide electricity to power the tools used by the artists, as at this time the gardens were not connected to the electricity grid. The number of people visiting the botanic gardens to view the sculptors at work was soon so large, a new car park was needed. 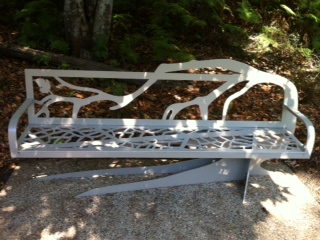 This was quickly created by a generous local earthmoving contractor as his way of donating to the gardens. 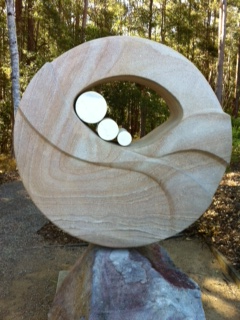 The Sculpture Garden had been specially landscaped and created from bushland to provide a permanent home for the works of art. When the works were finished, each artist suggested to the Friends of the Botanic Gardens the type of setting in the Sculpture Garden they would like their works to be placed. Moving the finished works to the Sculpture Garden was a major undertaking requiring heavy lifting equipment. A crane truck was used to install most works and a heavier crane had to be brought in for the larger pieces. Installation of all the works took several days. 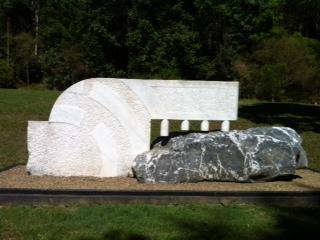 The black and white marble stones were selected in Chillagoe in North Queensland and then transported to the gardens. The sandstone was obtained from the Helidon area located in the South-East Queensland Lockyer Valley. Some local granite boulders were supplied for the symposium but were not used. 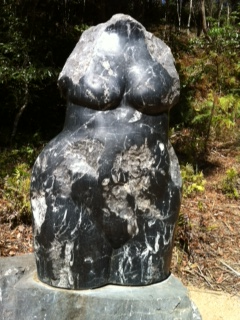 To keep the black Chillagoe marble sculptures looking shiny, they must be treated twice a year. This entails light sanding with a very fine sandpaper to remove scratches and marks, then using a few drops of special oil to give a lovely, black, polished look to the works. The white marble and sandstone works require only an occasional clean with light water pressure. Sandstone is a fairly soft stone and too much water pressure work can cause erosion of the surface of the stone. All sculptures have been carved from one block of stone, not glued onto the natural rock as some people think. 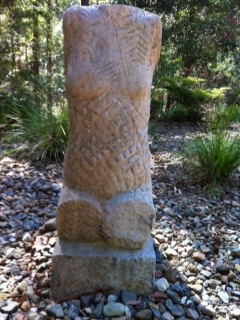 The sculpture is carved initially using diamond saws, then air chisels and grinders, and from the rock, a snake, goanna or other work of art will emerge. 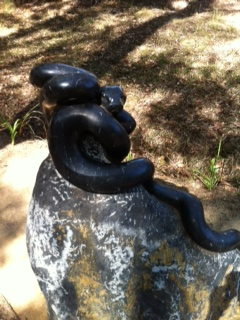 For example, Australian artist Silvio Apponyi, whose many works you will see displayed in the garden, always starts his snakes from the tail and works up towards the head. This is not the original sculpture created by Craig. The first Spirit House developed a crack from within its heart, and was replaced by this new work. 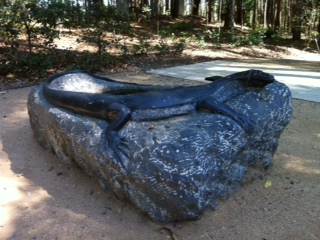 The original work was removed due to safety concerns but can still be viewed, in the horizontal, near the picnic shelter in the Sculpture Garden near the end of the trail. 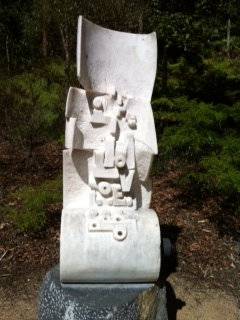 The three white marble cylinders within the fold of the sculpture represent 'family'. Lean against the sculpture and the sculpture rotates on a stainless steel shaft and bearing. Craig Medson and his wife Fiona, who is also a sculptor, project-managed the Sculpture Symposium in 2005, inviting artists they had worked with in other symposia overseas. In the early days, when volunteers were working at clearing the bush of weeds and exotic trees, a carpet snake, which they called Axminster, resided here. This sculpture by Silvio is fondly called Axminster by the Friends of the Gardens. Silvio finished the sculpting, but after the initial work was finished, the sculpture needed to be polished. Volunteers wore out many fingertip rubber gloves doing this polishing, starting with rough sandpaper and ending the process with the finest of sandpaper. Because volunteers did the polishing, Silvio could move on to a new sculpture, instead of spending his limited time polishing. The Python regularly gets a treatment of sanding and oiling to keep it shiny. Feel the smoothness of the beautiful snake. Silvio sometimes, but not always, adds to his works a small frog which is not always easy to find. See if you can find it in this and others of his many works displayed in the Garden. Young children love to help in this search. M.J. has several torsos in the Sculpture Garden which are distinctive and easily identified. The torsos are imperfect, as, in the artist's words - 'no woman's body is perfect'. This artist was able to do so much work in such a short time as only minimal stone had to be removed to allow the natural shape of the rock to reveal the essence of a torso. This piece was created as a response to the natural shape of the stone, when the artist saw a figure in the stone to be 'released'. 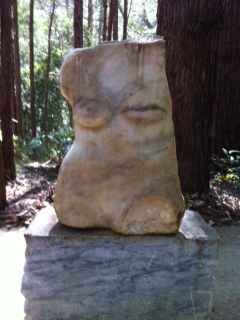 As a result of the popularity of her sculptures displayed in this Garden, M.J. was commissioned to do a marble sculpture in the Noosa Botanic Garden. This work sits near a Casuarina tree, the position having been specifically requested by M.J. herself. M.J. had never worked in sandstone before and found it very soft compared to marble. She therefore had to experiment with different tools and textures in the creation of this piece. 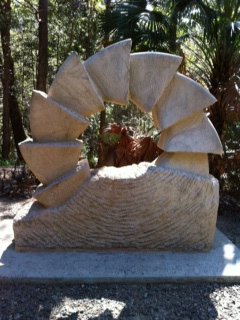 The leaves around the sides of the sculpture are those of the Cabbage Tree Palm (Livistona Australis). 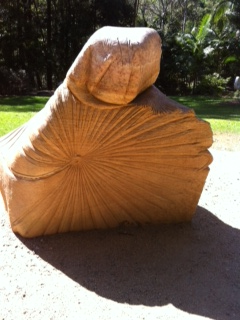 A large living example of this palm can be seen near the pathway by the sandstone sculpture, The Cycle, to be found further along the trail. Hwang is interested in portraying history in his works. In this work he does this in two ways - the marble is carved to resemble a scroll of rolled paper with pages and letters on the vertical section, and on the bottom section on the right there is a black marble form (like a wooden roller from a historical scroll). If you put your ear to it, you can hear the wind of history passing through the scroll. This sculptor has cleverly hollowed out the bottom of this sculpture allowing air to pass through it, so the holes on the front can be played with your hands like a percussive instrument. 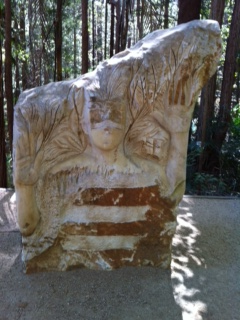 Silvio was invited back to the Gardens in 2006 and again in 2007 to create some more animal sculptures in marble. 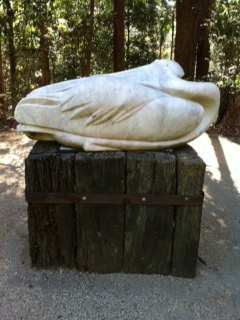 Silvio could 'see' a reclining Pelican in the natural shape of this marble block. He said that he just had to 'release' it from the stone! While Jaroslava's husband, Jan, did all the heavy cutting work on Infinity, which is the next sculpture displayed, Jaroslava had time to create this beautiful sculpture in black marble. The natural shape of the stone inspired her to see two lovers embracing within the stone. This was a very large work to create in the symposium time-frame. Jaroslava's husband, Jan, is also a sculptor and his skill and physical strength were needed to do most of the diamond saw cutting and drilling in the creation of this sculpture. Jaroslava did a lot of the finishing sanding and smoothing with Jan, so this work was a real collaborative effort. 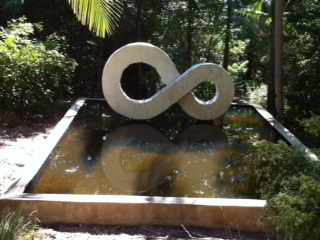 It was decided that the marble cut-outs of Infinity that you will notice placed nearby, would sit well in the Garden and give a bit of history relating to the piece. 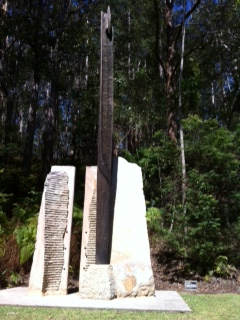 This sculpture is based on the significance of 12. For example - months in a year, the horoscope and time-keeping. Seiji normally sculpts in granite so he wanted to try some Australian sandstone. He could not believe how quickly the work progressed compared to working with granite. Needless to say, he had plenty of time to create this sculpture during the symposium. Seiji enjoyed the experience of working with Australian sandstone but was happy to continue working in granite when he returned to his homeland, Japan. This sculpture by Miguel can be interpreted many ways, which is the beauty of abstract art - different people can read it differently. It is obviously about contrasts - black and white, natural and man-made, night and day. If it makes you think and use your imagination, then the artist and his work have succeeded. 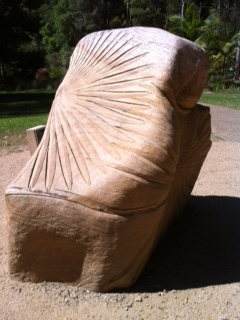 This work was created to honour the local indigenous people. The artist respectfully sought and received permission from a member of the indigenous community to portray an indigenous Man of Nature with trees growing out of his fingers and with traditional face markings. Take a moment to sit and rest. Enjoy the special calm and peace of the Garden. During the Symposium in 2005, the artists gathered for lunch under the shade of a huge Blackbutt tree. A Lace Monitor Goanna would often visit the artists during their break and climb the trunk of the tree above them. This was a great fascination, particularly to the overseas sculptors. These daily lunch-time visits of the Lace Monitor inspired Deidre to create this charming work. Two huge sandstone blocks and a Tallowwood tree from the Botanic Gardens were sculpted then assembled, in a beautiful setting. To create this work in only two and a half weeks was a mighty and impressive achievement. The composition and the setting create a powerful sculpture. It is left up to you, the viewer, to decide how to interpret The Passage. The large block of Jean-Paul's sculpture The Passage had a natural flaw running through it. While being moved, this flaw opened up and a large piece cracked off and broke away, falling to the ground. It was decided to make this fragment into another sculpture to be placed and displayed alongside the original work. 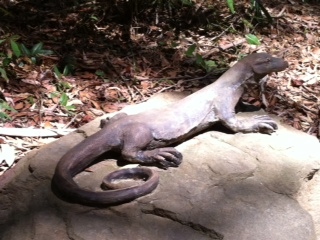 Jean-Paul has since visited the Sculpture Garden and is said to be very happy with the way it is now. Two sculptures have been presented and sit side by side in the Garden. This very interesting torso came quite easily to the artist. The black marble had so much natural character, M.J. needed only to cleverly emphasise areas here and there to form the female torso. The work has a powerful 'Earth Mother' or 'Fertility Goddess' presence about it. There is a log behind this seat where those involved in the very early stages of the planning and design of the Botanic Gardens used to sit, imagine, talk and dream of what could be. 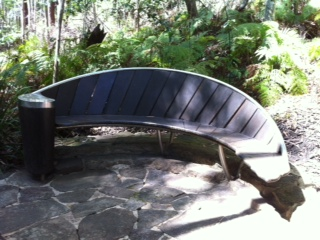 This seat represents the Gardens emerging from the natural bushland and from the dreams and hopes of these men and women.